Alpha, or excessive returns greater than the market average, is extremely hard to obtain over long periods of time. 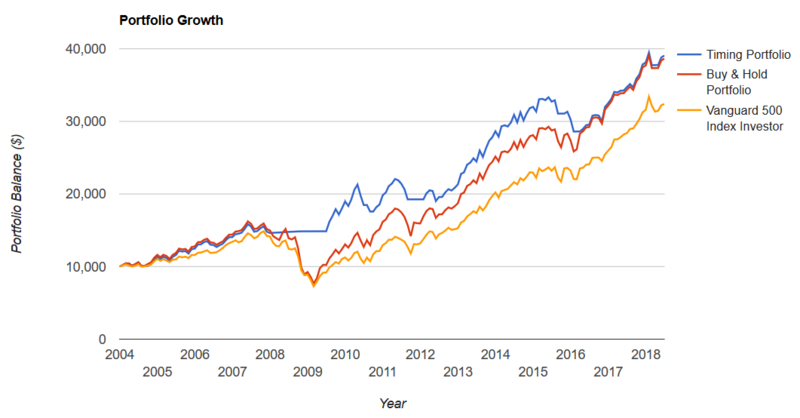 So when you read something like the title of this post – Supercharged Index Investing – then it is easy to understand how you would be skeptical. …I definitely do not want this blog to convey the idea that earning 20%+ CAGR for many years is by any means easy, or possible. Perhaps this is possible on a very small capital base, but over time, the returns on pretty much ANY strategy will slowly revert to a fair rate of return (risk and return are in balance). And that is only about returns of +20% CAGR. The main point is that extended periods of returns greater than 20% are very hard to pull off. However, that should not mean we don’t try to still beat the market. *Note: And I am not going to argue that this system, or any other system I cover here on Robotic Investing can come close to sustaining 20%+ returns. Not realistic at all. When opponents of the idea that an investor can beat the market, the approach they refer to is a simple buy and hold portfolio. Their argument is that there is no use trying to beat the market, and instead a more logical strategy is to just buy the S&P500 and move on. Over time most investors manage to only get market returns, and many can’t even achieve that. And buy and hold is probably a perfectly good strategy for a lot of people. Even more so, combine the S&P500 with other assets like in the Coffeehouse Investor does and you are more diversified. 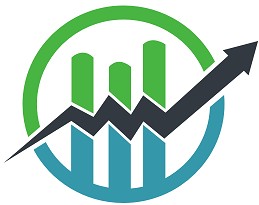 This provides protection of capital since you are not 100% exposed to the stock market. However, here at Robotic Investing I am after more than just market returns. I want better risk adjusted returns than the S&P 500. That is where Supercharged Index Investing came from. Objective: To beat the returns of the S&P500 (SPY) on a risk-adjusted basis. That objective has lead me to invest in the TQQQ and Accelerated Dual Momentum. 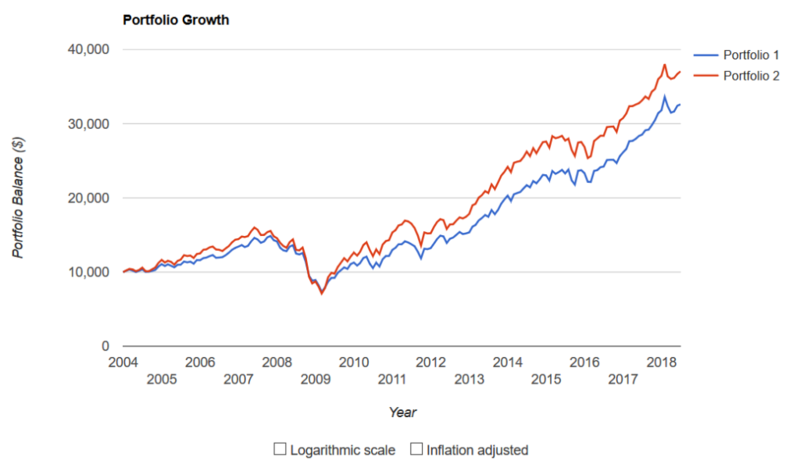 However, I have also been looking for a semi-passive strategy where I could buy and hold a basket of equity ETFs and get better risk-adjusted returns than just an investment in the S&P500. Let me walk through the assets the strategy is built on. The S&P500 is an index that gives more weight to the larger companies than the smaller companies in the index. In other words, the companies with the largest market capitalization, or the greatest values, will have the highest weights in the index. The problem with this is it can overweight the largest companies and miss opportunities available within the smaller companies. All of the S&P 500 companies are good companies – if there weren’t they would not be part of the index. So what about the alternative; an equal weighted S&P500 index. An equal-weighted index is just as it sounds; each index constituent is given an equal weight in the portfolio. All companies, regardless of size, will be represented equally in the index. I wanted to test in myself, so I went to Portfolio Visualizer to have a look. 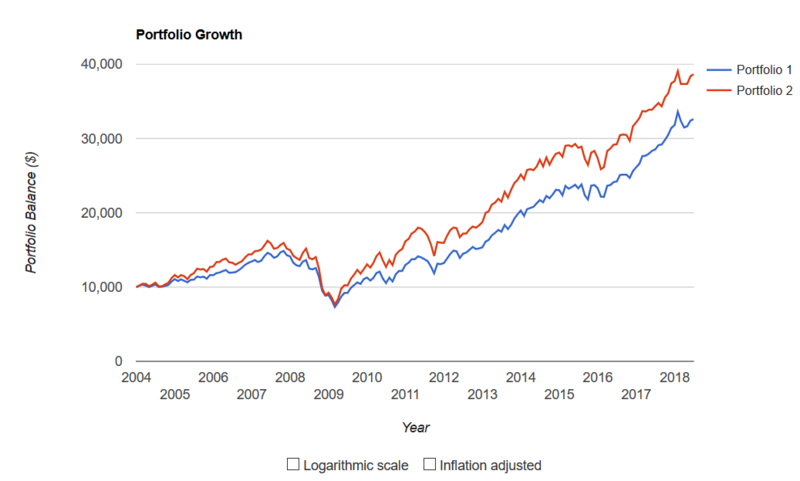 Here are the results comparing a $10,000 investment in SPY (blue line) versus an investment in RSP (red line), which tracks the equal weighting S&P500. Stronger performance going back to 2003, and suggests that a portfolio with RSP may be something to consider. The other problem with just investing in the S&P500 is you miss potential returns with smaller companies. Investing in smaller companies has been shown to improve performance. In fact, even the Coffeehouse Portfolio uses smaller companies as part of its portfolio to take advantage of that. However, because I am trying to manage downside risk I wanted to stay away from small-caps, and decided to test out the mid-cap market. Here is how both of these assets compare from a return perspective. MDY is the red line, and SPY is the blue line. Looks like MDY has done much better, going all the way back to 1996. Let’s look at the funds together as a Supercharged Index Investing portfolio. The results are interesting. The MDY and RSP portfolio had a higher CAGR, but slightly higher drawdowns. The Sharpe Ratio and Sortino Ratios are very close, indicating that the risk adjusted returns are similar. That got me to thinking – is there a way to manage that drawdown and get better risk-adjusted returns? I tested that next. One of the most common ways to manage drawdowns is to use trend following principles in a portfolio. I do that with my TQQQ holding. I went ahead and test holding a 50/50 portfolio with MDY and RSP, but using a 10-month moving average circuit breaker on SPY. If SPY dropped below the 10-month moving average, then MDY and RSP are both sold and the portfolio goes to cash. Once it breaks above the 10-month moving average again, MDY and RSP are once again purchased and held until the 10-month average is broken again. The results are interesting for sure. 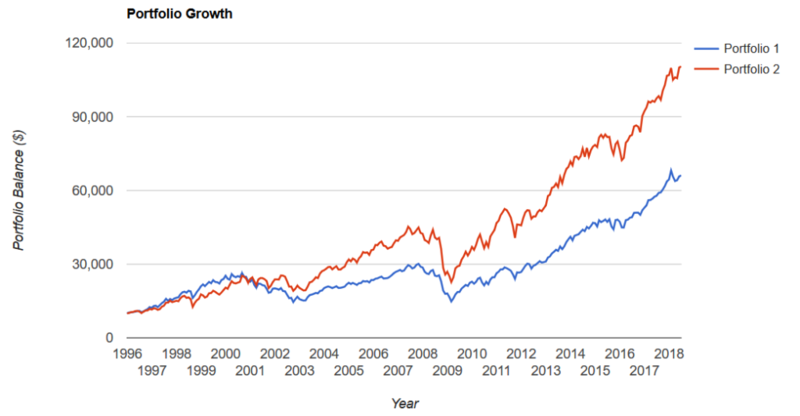 From a CAGR perspective, using a market filter with a 50/50 portfolio of MDY and RSP beat a portfolio with just the S&P500. It even beat just buying and holding MDY and RSP and not using the market filter. The real benefit is in the Worst Year and Max. Drawdown. Using a 10-month moving average market filter, the worst year was only -5.37% and the maximum drawdown was only -17.39%. That is way easier to stomach than a -50% drop in the S&P500 or buying and holding MDY and RSP. Those are strong results. That is why I personally use this strategy in my own portfolio. It gives me a little extra kick, while still investing in the overall market. Overall, as the Sortino Ratio indicates, the risk-adjusted return is much better than a standard buy and hold in the S&P500 which as stated above, is the objective I have at Robotic Investing. As with other portfolios on Robotic Investing, I track real-world implementation of the Supercharged Index Investing Portfolio. To see how the portfolio performs in real-time and the real world, check out all the blog posts tagged with the Supercharged Index Investing category. Which Portfolio Visualizer screen did you use to run this test? 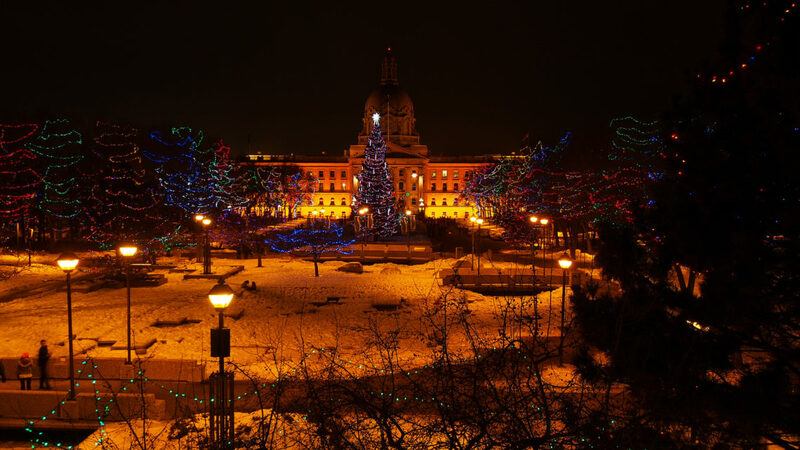 Hi Dave – it was the Market Timing one with Moving Averages.